The good news is that you don’t have to waste time searching through Target (along with everyone else) or spend a fortune on packs of Valentine’s Day cards. There is a better solution, and that is: Valentine’s Day card printables. 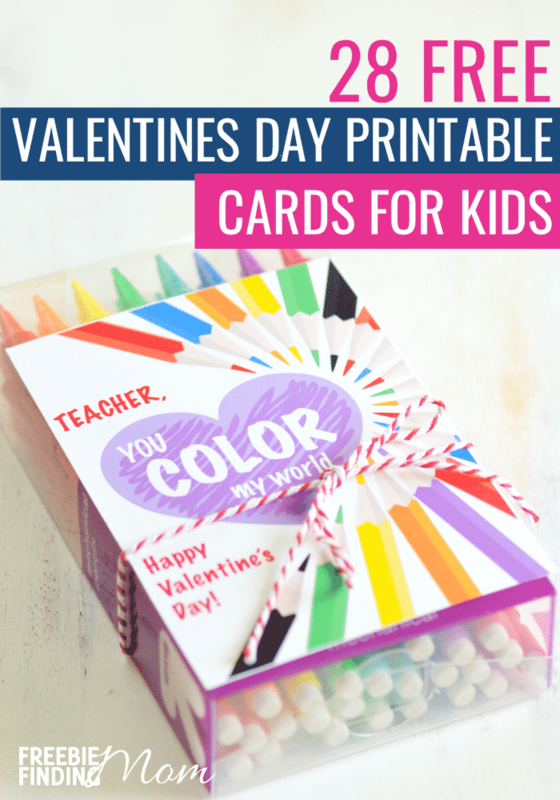 These printable valentine cards for kids are FREE and often more fun than the Valentine’s cards you find at the store. (This gives you more money to spend on candy or cupcakes for your kiddo to take to school–or just helps you save some cash for the essentials.) Just print them out, cut them up, distribute them, and you’re done! If you have some time to DIY, some of the valentine printables below also involve fun crafts. Below, you can find free printable valentine cards of all kinds, whatever your kid’s interests and age. Animal-themed valentine card printables? Yep. Pokemon-themed printable valentines? You got ’em. There’s even mustache-themed printable kids valentines! You’re sure to find something that will make your kiddo–and their friends and classmates–smile. And by the way: printables aren’t just for Valentine’s Day or cards. I love printables for to-do lists, chores, packing lists, family budgets, and more! They help keep me organized (and sane!). Get your free printables on Freebie Finding Mom’s Printables page. Also, feel free to check out Pinterest for an ever-updating list of Freebies and DIY Fun. 1. Cute Free Printable Valentine’s Day Cards (Freebie Finding Mom) – These printable valentines are cute as a button and perfect for the kiddo who loves puppies, kitties, and all things cute. They’re also super easy to assemble: just print, cut, and address! 2. Free Animal Valentines – Unicorn, Sloth, and Narwhal Valentines (Mom Envy) – These Valentine’s Day card printables take a little extra work to cut out, but the end result is so cute. The valentines are shaped like the animals themselves, with their arms taped together to hold a pencil, piece of candy, or other Valentine’s Day treat. 3. Gumball Machine Free Valentine Card (Savings Lifestyle) – What kid doesn’t love bubble gum? This free printable valentine is great for boys and girls alike and is easy to put together. Simply cut the printable apart and put each card in a clear plastic bag with gumballs. 4. 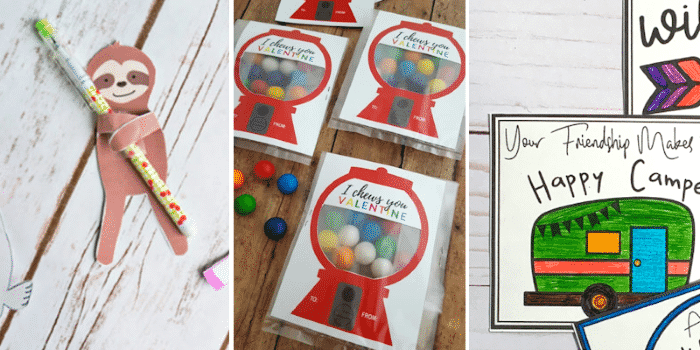 Valentine Slime with Free Printable (DIY with My Guy) – I love this creative idea! If you have a bit of time to do this project, it’s well worth it. This printable kid’s valentine includes a easy recipe for DIY ” Valen-slime” that your kid will love making. 6. Camping Free Printable Valentine’s Day Cards (That Kids Craft Site) – If your kid is a little older and outdoorsy, this is the valentine for them. There’s also the option for your kid to color them in! 7. Rubber Ducky Valentines (U Ready Teddy) – Like the glow stick valentine, this free printable valentine substitutes a fun toy for candy. It would be great for little kids who still love to splash around in the bath!